Susanne Ward, owner of Rock City Coffee Roasters and Rock City Cafe, transitioned her company's business model to that of an employee-owned cooperative. 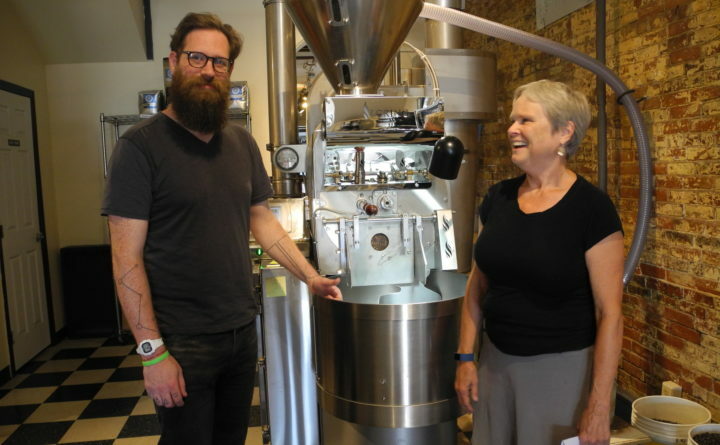 Kevin Malmstrom, the head coffee roaster, is one of 17 owner-employees. ROCKLAND, Maine — For the last two months, patrons of Rock City Coffee might not have noticed any changes when they stopped at the busy downtown cafe for their regular order. That’s exactly what the the new owners — the people behind the counter — want. Two months ago, Rock City Coffee, a cafe and coffee roastery, became a worker-owned cooperative, with employees buying the business from its previous owner and founder, Susanne Ward. For Ward, selling the business to her employees was a reward to people who worked for her and a way to ensure that what she and her husband began 26 years ago would live on true to character. For the employees, the opportunity allowed them a path to business ownership and to keep Rock City as the place where they love to work. “I hated the idea of somebody else coming in and trying to change everything. I feel like because it’s [an employee] cooperative, it will always be Rock City,” said Kevin Malmstrom, who has worked at Rock City for 14 years and is now one of the 17 employee-owners. The transition from single-person ownership to an employee-owned cooperative has been in the works for about three years. On March 9, the company was sold to 17 of the 30 employees, forming the new Rock City Employee Cooperative. Until closing day on the loan the cooperative took out to purchase Rock City, each of the 30 employees had the opportunity to join the cooperative and become part owners of the business. Employee-owned cooperatives are on the rise across business sectors, according to Rob Brown, director of business ownership solutions at the Cooperative Development Institute. This is especially true in Maine, Brown said, largely due to the state’s aging population, with business owners finding themselves at retirement age but not wanting to endure the traditional sale process. Ward started Rock City in 1992 as Second Read Books and Coffee, with her husband, Patrick Reilley. It was her dream to sell books and his to sell coffee. The business morphed over the years. The coffee shop became more of a cafe and the late 1990s saw the addition of the roastery. In 2005, the name changed to Rock City Books and Coffee. But the going was not always easy. For years Ward said they were “pouring money into” the business. Then in 2010, Reilley died. Faced with a mountain of grief and the prospect of running the business on her own, Ward managed to pull the business above water. To focus more on the roastery and cafe, she sold the bookstore — her initial love — to an employee, who now operates Hello Hello Books in the back of Rock City’s cafe. But through it all, Rock City stood tall as a pillar in the Rockland community — something Ward said wouldn’t be the case if it weren’t for the people working there. “I can’t tell you the number of times people have stopped me on the street to tell me how much they love my employees,” Ward said. As Ward approached retirement, she wanted to have a succession plan for the business and she entertained a few offers from outside parties interested in buying Rock City. But Ward knew that what she, her husband and her employees managed to build with Rock City was special. Selling the business to someone who might change it just didn’t feel right, she said. An employee-owned cooperative would ensure that Rock City stayed largely the same, while also rewarding the people “who worked so hard,” Ward said. “With my staff, their first thing that they said they want to do with the business is maintain what they have and build on what they have,” Ward said. Three or four months after Ryan Flanders started working at Rock City Cafe as a cook, he was presented with the option to become a part of the employee cooperative that would assume ownership of the business. Having worked in other kitchen settings, Flanders said this was a unique shot at being a part owner of a business, especially since he has a young daughter. While taking on a business might be a daunting task for an individual entrepreneur, owners in a cooperative model have fellow employees who share management responsibilities. Natalia Ayala, who has worked at Rock City for three years, said taking ownership of an established business also helped ease concerns. Now, if employees want to join the Rock City Employee Cooperative, they must have been employed at Rock City for at least 15 months and apply to the cooperative board for membership. Leading up to the finalizing of the loan and cooperative formation, Malmstrom said a big focus was put on education, to make the prospective employee-owners aware of what to expect and what was expected of them in ownership. Another boon to the cooperative ownership model for Rock City employees was the ability to take on as much, or as little, responsibility as they can. Ayala, who has two small children, said she’s working fewer hours as a barista in the cafe and instead is taking on additional cooperative tasks that she can do while caring for her children. Flanders is currently on the promotions committee, one of three committees — along with personnel and finance — that report to the cooperative board. “I feel like there is enough to go around for everybody, where no one person is feeling really overwhelmed,” Malmstrom said. While the employee-cooperative model is new to Rock City, the feeling of employees being at the forefront of the business is not — which is why Ward and the new owners think the coop fits perfectly.